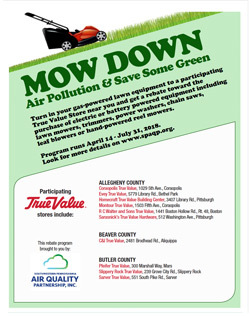 PITTSBURGH, April 7– The Southwest Pennsylvania Air Quality Partnership, Inc.’s Yard Equipment Exchange rebate program runs through July 31 and Southwest Pennsylvania residents can exchange gasoline-powered lawn equipment for a rebate toward the purchase of electric or battery-powered equipment at 12 participating True Value stores in Allegheny, Beaver, Butler, and Greene Counties. The Partnership is offering 400 rebates, available on a first-come, first-serve basis, one rebate per household for an electric or battery -powered lawnmower, trimmer, chainsaw, power washer, leaf blower or push mower, provided a piece of working gasoline-powered lawn equipment is exchanged. Residents, at their convenience, may visit their local participating True Value Store to exchange the lawn equipment. o $50 toward the purchase of a new electric power-washer. Ground-level ozone affects everyone, but the young, the old and those with respiratory problems are most at risk. However, when ground-level ozone concentrations are unhealthy, particularly during Air Quality Action Days, everyone is at risk. The purchase of the new electric or battery-powered lawn equipment must be completed by June 30 and the rebate information mailed into the Partnership by July 15. To claim the rebate, residents need to send a copy of a receipt, the UPC code from the product box and the rebate coupon they received at the True Value Store. 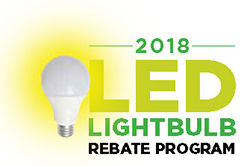 Rebates for switching to LED lighting are available at participating TrueValue Store near you. Taking advantage of this program can help save energy and costs on future electric bills. Program runs April 1 - April 30, 2018. 2011 News & Events archive.